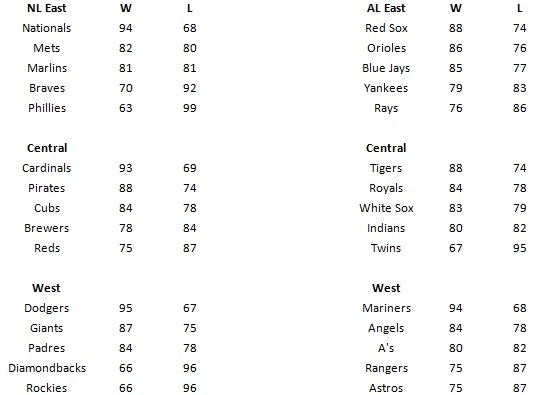 Opening day is finally here, and it is time for totalsportsblog.com’s 2015 MLB team by team record predictions. Last year, I did this in mid-February and should have clearly waited until the end of spring training. 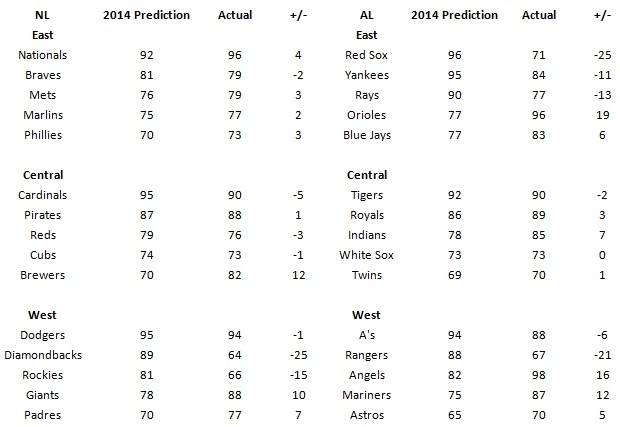 Taking a look back at my predictions, I only correctly predicted the record of one team. The Chicago White Sox. I pretty much nailed the NL East and the AL Central. But after that, I was WAY off on some others. In last year’s article, I also predicted the biggest jump and drop-off in wins. Predicting that the Marlins and Astros would have monster win increases was pretty easy. Both were coming off atrocious seasons, and the only way to go was up. But, when an Atlanta Braves fan invaded the comments section after my prediction for a big drop-off, it made it just made my day. Boy was I wrong when it came to the Boston Red Sox and New York Yankees. Who would have thought that spending $471 million in one off-season couldn’t guarantee the Yankees at least 90 wins? Enough about 2014, let’s get into 2015. Today is Opening Day, unless your team played in the made for TV, Sunday night game. That thing needs to be set on fire. Please, just get rid of it. 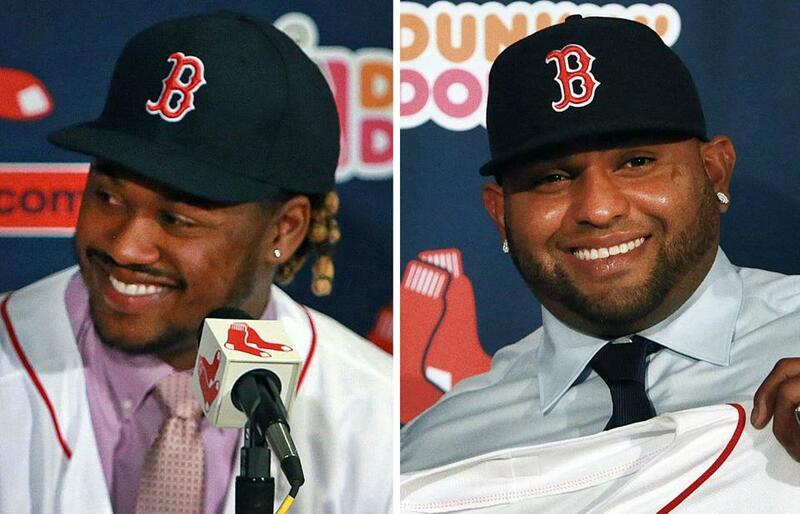 I missed badly with the Red Sox last year. I won’t miss this year. With the mid-season trade of ace left-hander John Lester, the Red Sox needed to find a way to erase one of the worst run differentials in all of baseball. When Boston realized that they might not be able to lure Lester back via free agency, General Manger Ben Cherington went on the offensive. 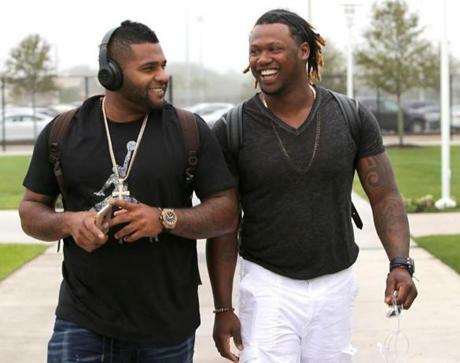 Cherington dished out approximately $180 million to World Series MVP third baseman Pablo Sandoval, and All-Star shortstop now moving to left field, Hanley Ramirez. To add much needed depth in the pitching rotation, Cherington later traded Yoenis Cespedes, who he had traded John Lester for last season, to the Tigers for Rick Porcello. The following day, Justin Masterson was signed to a 1 year deal along with a trade that brought over Wade Miley from the Arizona Diamondbacks. I would say that was a pretty big roster overhaul in a few short weeks. While the Red Sox might not have the big ace at the front of their rotation, they have a very deep rotation to go along with one of the better offenses in the league. Anything short of an AL East title should be considered a disappointment in 2015. You have to love Adidas trolling the Cubs. This offseason, Cubs President Theo Epstein was ready to start reaping the benefits from the #1 farm system in baseball, and some of the deepest pockets as well. The Chicago Cubs have been cultivating some of the best young talent around, and the first wave of kids are ready to make an impact. Cheap, top-flight talent, has allowed Epstein and Co. to keep payroll down, and be ready to strike when the time was right. The 2015 offseason was that time. The Cubs have all of the bats you could imagine, and they ready to make an impact. Anthony Rizzo, Starlin Castro, Jorge Soler, Javier Baez, and Arismendy Alcantara have already either established themselves as legit MLB players, or have just started to. And if it wasn’t for the stupid “Super Two” rule, the top prospect in baseball, 3B/OF Kris Bryant, would be patrolling the outfield or the hot corner for the Cubbies. But don’t worry folks, he should be mashing baseballs in a city near you by mid to late April. With all of that offense, who needs pitching? The Cubs do. Thats where the money comes in to play. Knowing that soon to be free agent pitcher Jeff Samardzija probably wouldn’t re-sign, GM Jed Hoyer sent him to the A’s for top shortstop prospect Addison Russell. Now what does this have to so with gaining pitching? The future savings allowed the Cubs to snag the number one free agent pitcher, John Lester. Lester’s 6 year $155 million deal made him the second highest paid pitcher in baseball. Lester will spearhead a rotation that also consists of 2014 breakout performers Jake Arrieta and Jason Hammel. Not to be overlooked, is the acquisition of catcher Miguel Montero. Acquired in a trade with the Diamondbacks, Montero still has 3 years and $40 million left on his contract. But don’t forget, Montero is one of the better offensive catchers in the game. Lastly, I’m not one to believe that a manager has much to do with wins and losses. The Cubs snagged Joe Maddon from the Tampa Bay Rays in what many people felt was a pretty sketchy situation. I personally don’t care about what happened, but Maddon seems to have some sort of “Mojo” that everyone is in love with. Maddon shouldn’t have much of an effect on this team considering how much talent is there. Talent wins games, not managers. The Cubs should be in the hunt for an NL wild card birth this season. This is going to be a fun team to watch. The only time to turn on the White Sox last year was when Jose Abreu was hitting or Chris Sale was pitching. 2015 will be a time when you watch the whole game. Each team has a checklist that they make once the season ends, and the South Siders seem to have check off pretty much every box. Pitching, specifically the bullpen, needed to be addressed. Signing LHP Zach Duke and closer David Robertson for $60 million, solves two problems. Adding a legit lefty to a struggling pen, and nailing down games with a top flight closer. But the biggest move was clearly the trade for starter Jeff Samardzija. Although Samardzija only has one year left on his contract, this is the type of move for a win-now team. Could Samardzija sign a contract extension? Sure, but the Sox don’t have much money coming off the books after the season. Most insiders believe the Sox have maxed out their credit cards for 2015 and possibly 2016. The rest of the 2015 budget was spent on LF Mekly Cabrera (3 years $42 mil) and 1B Adam LaRoche (2 years $25 mil). Each player was signed to a team friendly dollar figure, and will give Cuban slugger Jose Abreu, some much needed help in the lineup. I’m not sure if the playoffs are in the cards for the Sox, but they should be playing some meaningful games in September. What I do know is, this team will see a significant jump in the wins column. 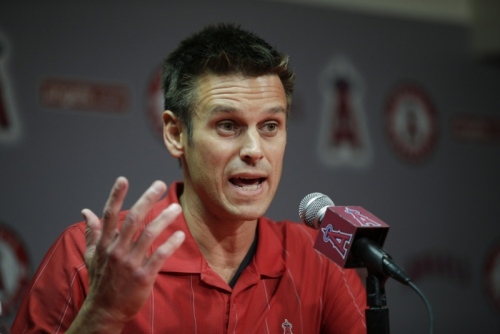 Angels GM Jerry DiPoto can’t believe that OF Josh Hamilton won’t be suspended for his drug relapse. Yes Jerry, you’re still on the hook for another $80 million worth of nothing. The Angels lead Major League Baseball with 98 wins last year. This year they will not do the same. GM Jerry DiPoto traded away their starting second baseman Howie Kendrick, for highly touted pitching prospect Andrew Heaney, in order to save $9 million in payroll and to bolster one of the worst farm systems in baseball. Many of the Angels offseason moves were minor league deals to help strengthen that farm system. Heading into the 2015 season, the Angels are in a pretty tough spot. Injuries and the crazy Josh Hamilton situation, doesn’t seem to be helping this organization one bit. The monster contracts given out to Albert Pujols, Josh Hamilton, CJ Wilson, and Jared Weaver, have this team completely hamstrung. Yes, Mike Trout is going to make a gazillion dollars, but his contract doesn’t get crazy for another 3 years. The Angels bullpen was pretty good last year considering it threw more innings than any other in MLB. Will it be able to hold up like it did last year? I don’t see it happening. I feel as if the loss of Kendrick at second base, the uncertainty at the bottom of their rotation, and the inability to get Josh Hamilton’s salary off their books for 2015, keep the Angels in the mid-80’s range as far as wins go. Nelson Cruz was a bargain on a 1 year $8 million deal last year. He’s now headed to Seattle for $50+ million (photo courtesy of thebaltimorewire.com). I’ll be honest here. I have no idea how the hell the Orioles won 96 games last year. 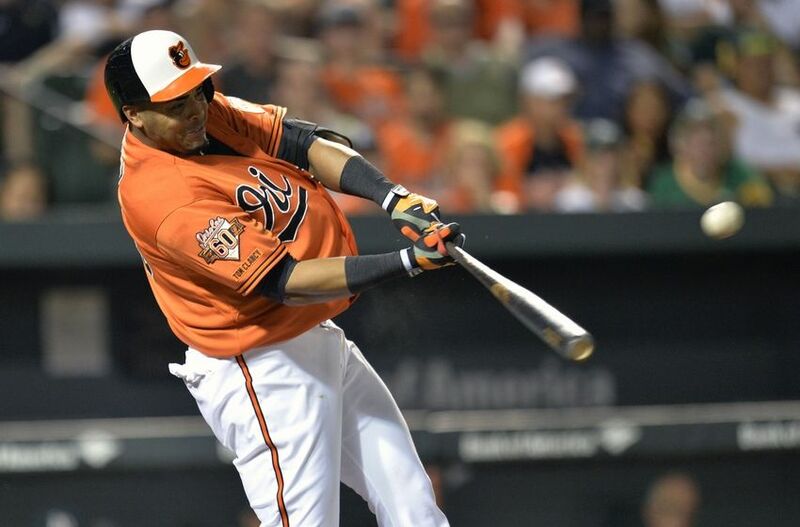 Catcher Matt Wieters, 3B Manny Machado, and 1B Chris Davis all didn’t finish the season due to injury or suspension. Aside from Chris Tillman, the only other starting pitcher I knew off the top of my head was Ubaldo Jimenez. I guess it was the acquisition of slugger Nelson Cruz that help carry this team, albeit most of his damage was done in the first half of the season (28 HR 74 RBI in the first half). But for a team coming off an AL East title and second post season appearance in three years, you would expect the GM to go out and look to bolster the squad for the following season. You know, to get them over the hump. Nope. Owner Peter Angelos is good. He’s not about spending that cash as long as a profit is being made. DH Nelson Cruz, RF Nick Markakis, and LHRP Andrew Miller are all gone and were replaced by, ummm….no one? Nice job O’s. You have enough talent to win in the mid-80’s, but I’m not sure that they will be able to advance farther than the Wild Card. 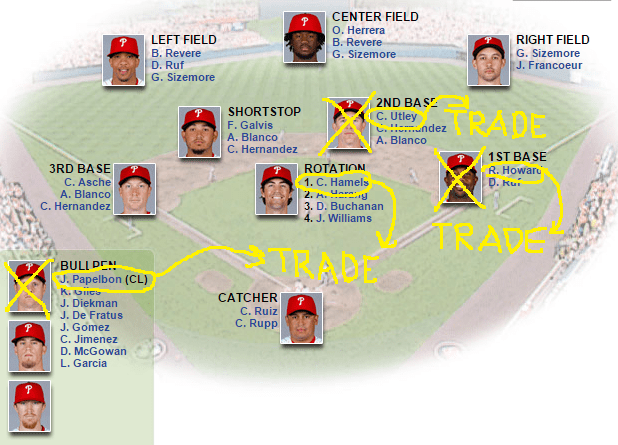 Phillies GM Ruben Amaro Jr. has run this organization into the ground with horrific trades and contracts. After the Atlanta Braves shipped closer Craig Kimbrel to the San Diego Padres on Sunday night, it was a toss up between the Braves and Phillies for this spot. I went with the Phillies because they are a text-book dumpster fire. If you have followed me on twitter @EarlTSB, I called for the demise of the Phillies back in December of 2010. GM Ruben Amaro Jr has taken a team coming off a World Series title in 2008 and 103 wins in 2011, to back-to-back 73 win seasons. 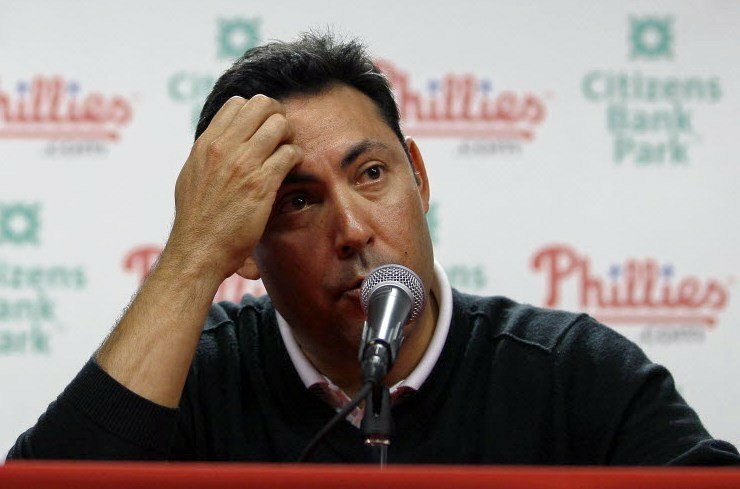 After giving absurd contracts to aging and declining players Cliff Lee and Ryan Howard, Amaro has done absolutely nothing to replenish the farm system and offset these bloated contracts. Chile Lee has been effective for the Phillies, he’s the exact type of player that Amaro could and should use to re-stock the bare cupboard known as the minor leagues. Oh wait, he got hurt. SCRATCH THAT ONE. Of the players Amaro Jr. did actually move, Jimmy Rollins was the biggest name. Waving his 10-and-5 rights, the shortstop accepted a trade to the Los Angeles Dodgers. In return, the Phillies got two pitching prospects, and also got another pitching prospect when dealing OF Marlon Byrd, to the Reds. That’s it though. I’m just going to leave this here for you to look at. Maybe my 63 wins were too high?